1 Free package of Cacique Pork Chorizo (9 oz.) in Kroger stores, with coupon. This Kroger Free Friday Coupon is available for download on Friday, October 26, 2018 but you have until November 11, 2018 to redeem it. What is Cacique Pork Chorizo? The Pork Chorizo is a highly seasoned meat and perfect to infuse recipes with the robust, spicy flavors known throughout Mexico. So if you are in a spicy mood, go get your coupon for a free package! Ingredients: PORK SALIVARY GLANDS, LYMPH NODES AND FAT, CHORIZO SEASONING (PAPRIKA, SALT, SPICES, MUSTARD, GARLIC POWDER), PORK, VINEGAR, SOY GRITS, SODIUM NITRITE. 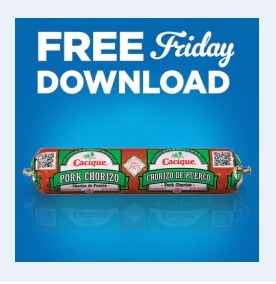 Redeem your coupon in-store within 2 weeks for 1 free package of Cacique Pork Chorizo (9 oz.). Your coupon will automatically be applied at checkout when you use your Shopper’s Card. Available in most stores.